Illustration of Hofbauer cells, which are placental macrophages, taking up Zika immune complexes (small blue circles connected by red Ys). From Zimmerman et al Cell Host Microbe (2018). The results were published online Nov. 14 in Cell Host & Microbe. Zika infection during pregnancy can lead to overt microcephaly - a smaller head and brain -- in the developing fetus, as well as more subtle neurological problems detectable later. Researchers had previously observed that syncytiotrophoblasts, cells that make up outermost layer of the placenta, are resistant to Zika infection. Yet studies of Zika-infected pregnant women show that the virus is present in the placenta in the majority of cases. However, Suthar says his team's research does not directly address the question of whether having anti-dengue antibodies - as a result of infection or vaccination - will worsen clinical outcomes in Zika infection. There are four strains of dengue virus, and infection with one strain does not lead to long-lasting immunity against the other three. In fact, secondary infection with a different strain can increase the risk of developing a more severe illnesses like dengue shock syndrome and/or dengue hemorrhagic fever. This is thought to happen through "antibody-dependent enhancement": pre-existing antibodies to the first strain, unable to stop the secondary infection, instead bind to immune cells and help the new strain infect them. On a cellular level, a similar phenomenon is occurring with Zika and dengue. When anti-dengue antibodies are present at the same time as Zika virus, they form complexes (clumps), which are taken up by the placenta. This is a normal process; it's how the mother can transfer acquired immunity to the fetus. 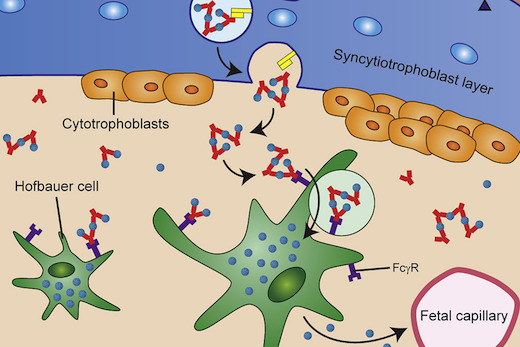 The placental cells grab onto antibodies by their Fc receptors, which are unvarying between antibodies. The Zika immune complexes increase viral binding and entry into Hofbauer cells, but also push them to mute antiviral responses. "This is not the only mechanism," Suthar says. "There may be others. ""Once the virus crosses into the placenta, it's down-hill from there," he adds, explaining that the fetal blood-brain barrier is not well-developed and viruses can then access brain tissue directly. The research was supported by National Institute of Allergy and Infectious Diseases (U19AI083019, U01AI131566, 2U19AI057266), the NIH Director's Office of Research Infrastructure Programs (Primate centers: ODP51OD011132), Children's Healthcare of Atlanta and the Georgia Research Alliance.